What sets Double D’s Cheesecakes apart from most others is that they are not a baked cheesecake, but a chilled recipe, which results in a very light and creamy texture rather than heavy and pasty as baked cheesecakes can be. Customers at Darlene’s restaurant used to tell her that after a big meal, they always had room for her cheesecake. They tend to compliment a meal because they are satisfying, not filling. It is the “Grand Finale to a complete dining experience”. Double D’s Cheesecakes leaves your guests with a great impression, one they won’t soon forget. Even the crust is homemade — a lot of bakeries use ready-mixed graham crumbs with vegetable oil added so they can just scoop and press. At Double D’s, we buy the crumbs dry and add our own spices and seasoning before adding vegetable oil. This method adds to the homestyle goodness that Double D’s Cheesecake is known for. The cheesecakes are made at our shop on Meadowood in St. Vital. 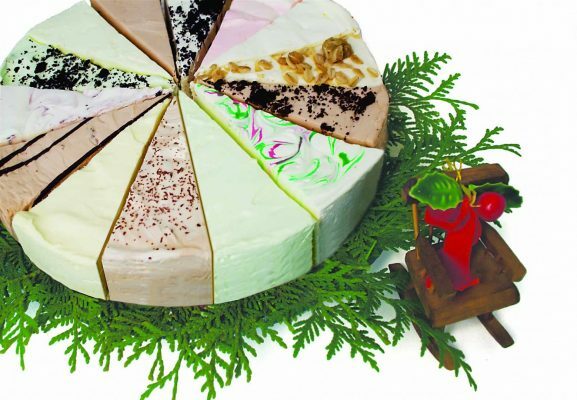 All the cakes are 9″ round, frozen and pre-cut into 14 slices. We recommend keeping the cheesecake frozen until serving. Once plated, the pieces are ready in about 10 minutes. Whatever you don’t use, put back in the freezer for a late night snack! When well wrapped, the cakes will keep for weeks, or even months in a chest freezer. With over 40 different cheesecakes on the menu, there is always something new to try, including many seasonal favorites such as Creamy Pumpkin at Thanksgiving, Eggnog and Candy Cane at Christmas, and White Chocolate Cherry Brandy at Valentine’s Day. Many new flavors are requests from chefs or customers. We’ll win you over with delicious, light and creamy cheesecakes and great-personalized service. Customer service and satisfaction is Double D’s Cheesecake’s commitment to their clientele. Pick one up for your next party or function.